When local fishermen catch a tiger shark, the mayor proclaims the beaches safe. Hooper disputes that it is the same predator, confirming this after no human remains are found inside it. 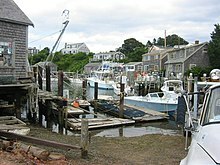 Hooper and Brody find a half-sunken vessel while searching the night waters in Hooper's boat. Underwater, Hooper retrieves a sizable great white shark's tooth embedded in the submerged hull. He drops it in fright after encountering a partial corpse. Vaughn discounts Brody and Hooper's statements that a huge great white shark is responsible for the deaths, and refuses to close the beaches, allowing only added safety precautions. On the Fourth of July weekend, tourists pack the beaches. 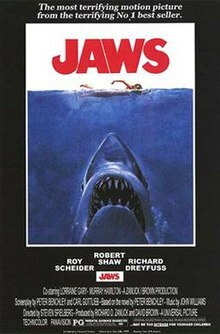 Following a juvenile prank in which the presence of a shark is simulated, the real shark enters a nearby estuary, killing a boater and causing Brody's oldest son, Michael, to go into shock. Brody then convinces Vaughn to hire Quint. Quint, Brody, and Hooper set out on Quint's boat, the Orca, to hunt the shark. While Brody lays down a chum line, Quint waits for an opportunity to hook the shark. Without warning, it appears behind the boat. Quint, estimating its length at 25 feet (7.6 m) and weight at 3 tonnes (3.0 long tons; 3.3 short tons), harpoons it with a line attached to a flotation barrel, but the shark pulls the barrel underwater and disappears. ^ a b Magill, Marcia (August – September 1975). "Jaws". Films in Review: 436. Britton, Andrew (1979). "Jaws". In Grant, Barry Keith (ed.). Britton on Film: The Complete Film Criticism of Andrew Britton. (2009). Detroit: Wayne State University Press. ISBN 978-0-8143-3363-1. Heath, Stephen (1976). "Jaws, Ideology, and Film Theory". In Nichols, Bill (ed.). Movies and Methods: An Anthology, Volume II. (1985). Berkeley: University of California Press. ISBN 978-0-520-05408-0. Kochberg, Searle (1996). "Institutions, Audiences and Technology". In Nelmes, Jill (ed.). An Introduction to Film Studies. London: Routledge. ISBN 978-0-415-10860-7. Lemkin, Jonathan (1984). "Archetypal Landscapes and Jaws". In Grant, Barry Keith (ed.). Planks of Reason: Essays on the Horror Film. Lanham, Maryland: Scarecrow Press. ISBN 978-0-8108-2156-9. Wyatt, Justin (1998). "From Roadshowing to Saturation Release: Majors, Independents, and Marketing/Distribution Innovations". In Lewis, Jon (ed.). The New American Cinema. Durham, North Carolina: Duke University Press. ISBN 978-0-8223-2115-6.